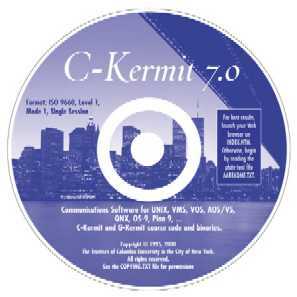 The C-Kermit 8.0 CDROM is not ready yet. Watch this space for announcements. 554 Megabytes of fun! It contains everything from the C-Kermit and G-Kermit areas of our FTP site: sources, makefiles, scripts, binaries, tar and ZIP archives, install packages, text files, and the C-Kermit 7.0 Update Notes, all organized for easy access through your Web browser (but a Web browser is not required). For maximum convenience, text files are replicated in three directory trees: DOS format (CRLF), UNIX format (LF), and Macintosh format (CR). Also included are close to 500 prebuilt binaries; about 400 for all the platforms where C-Kermit runs (UNIX, VMS, VOS, AOS/VS, Plan 9, Amiga, . . .) and another hundred for G-Kermit. C-Kermit 6.0 (or earlier) binaries are included for platforms for which we don't have C-Kermit 7.0 binaries, such as Apollo Aegis, Tandy 6000, 2.11 BSD, etc. In other words, binaries are included for every platform that we have binaries for: all the ones you see HERE and: HERE, except that some of the duplicates have been omitted (e.g. CC and GCC builds for exactly the same platform), due to lack of space. This might very well be largest collection platform-specific binaries for a single program, ever. Not only does it cover all the latest hardware and operating systems, but also lots of older ones, all the way back to the 70s and 80s (and yes, a surprising number of them are still in operation). Since full source code is included, this collection also can serve as an practical "laboratory" in software engineering, portability, and history. highlighting the API differences among more than a hundred different UNIX varieties as well as non-UNIX operating systems, not to mention the many dialects of the C language. Extensive implementation notes are included.